Instant downloads of all 942 LitChart PDFs (including On the Road). 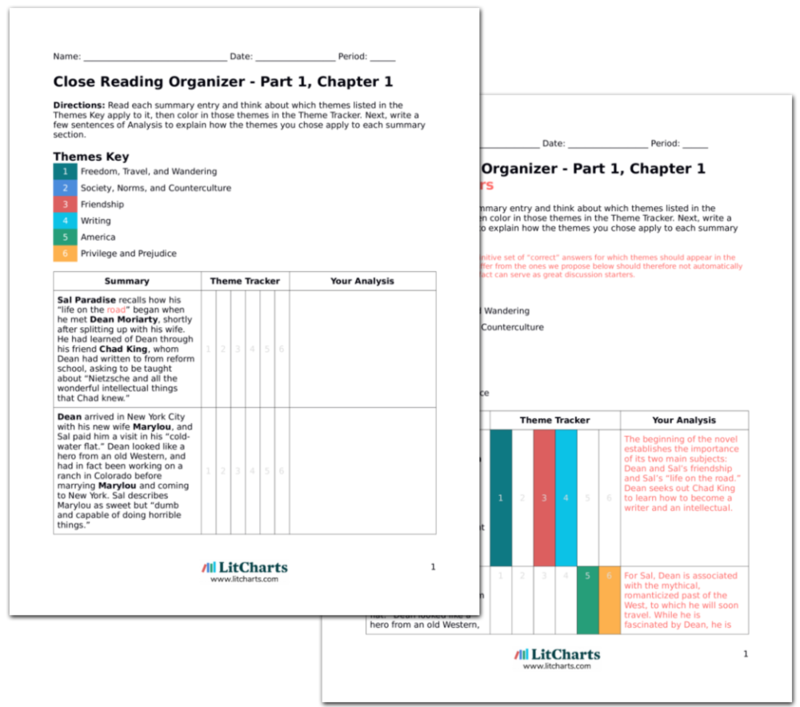 LitCharts assigns a color and icon to each theme in On the Road, which you can use to track the themes throughout the work. The next morning, Dean was worried because his fingerprints were all over the stolen car, which he realized belonged to a detective. Sal and Dean hurriedly packed their things and left. They went to a travel bureau in Denver and found a Cadillac that needed to be driven to its owner in Chicago. Sal and Dean get back on the road to avoid the law, and this suggests another aspect of the road: it is also escape, the freedom it offers is a freedom from the consequences of their actions. Dean picked up a waitress, whom he convinced that the Cadillac was his. He drove off with her, leaving Sal and two other passengers behind for a while, and then came speeding back to pick everyone up. Dean, Sal, and the passengers (two young Irish men) departed in the Cadillac. Just outside of Denver, Dean broke the car’s speedometer by going over 110 miles per hour. Dean decides to have some fun with the car, ignoring Sal and two other passengers who are supposed to come along to Chicago. Dean breaks speedometers the same way he breaks laws or social conventions. He is always pushing boundaries. Dean told Sal that he wanted to stop at Ed Wall’s ranch on the way to Chicago. He said that the waitress he had picked up, named Beverly, was going to come to New York and marry him as soon as he divorced Camille. As they got onto a dirt road leading toward Ed Wall’s ranch, it was raining and Dean drove so fast that the car slid in the mud and ended up in a ditch. Dean has apparently made another careless promise to another woman that he has no intention of keeping. While on the road, he wants to stop and see his old friend Ed Wall. Yet his carelessness once again gets them into trouble. Dean has a "purity" about him in the sense that he is always true to himself and lives in the moment. Yet in being true solely to himself he is never true to others—he is selfish, dangerous, and breaks things. Dean went to get help from a nearby farmer, who towed the car out of the ditch with his tractor. Sal told the two passengers in the car that Dean was mad but he was Sal’s brother. Dean and Sal admired the farmer’s beautiful daughter, who watched the car get towed. Sal continues to refer to Dean as his brother, because they are such close friends. Dean and Sal objectify the farmer’s daughter, as they do to virtually any woman they come across during their travels. Get the entire On the Road LitChart as a printable PDF. At last, they got to Ed Wall’s ranch. Sal says that Ed was like “Dean’s older brother.” Ed’s wife cooked a large meal for everyone. Dean tried to convince Ed that he owned the Cadillac, but Ed thought Dean had probably stolen it. After the meal, Sal, Dean, and the two passengers got back on the road. Dean’s friends fill in for the void left by his absent family. Thus, Sal and Ed are like brothers to him. Sal and Dean don’t stay at Ed’s for long, keeping a quick pace on their journey. Fredericksen, Erik. "On the Road Part 3, Chapter 8." LitCharts. LitCharts LLC, 5 Feb 2014. Web. 22 Apr 2019. Fredericksen, Erik. "On the Road Part 3, Chapter 8." LitCharts LLC, February 5, 2014. Retrieved April 22, 2019. https://www.litcharts.com/lit/on-the-road/part-3-chapter-8.